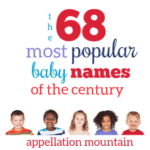 Long and lovely girl names dominate the current US Top Ten. Romantic, flowing choices like Olivia and Isabella appeal to many parents. Let’s say that you love this sound and style – but want something at least a little less common? 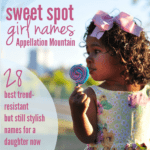 These 19 lovely girl names deliver. They’re every bit as elaborate, but not nearly as popular. To make this list, a name had to measure four syllables or more, and rank outside of the current US Top 50. Many of these don’t even crack the current Top 1000. Elaborate and romantic, Anastasia brings to mind the youngest daughter of the last Tsar of Russia. The family’s story ends in tragedy, but rumors that the princess somehow survived persisted throughout the twentieth century. Today’s generation of parents grew up with a 1997 animated musical re-telling of the tale. Maybe that’s why the name now ranks higher than ever in the US. Read more about Anastasia here. Most of the feminine forms of Anthony belong on this list, like literary Antonia. But given our affection for -ella names, four-syllable Antonella feels like the best choice. It brings to mind favorites like Isabella, but feels just slightly different. Sweetly vintage nickname Nell feels like another benefit. Speaking of -ella names, Arabella fits right in, too. The origins of the name are obscure, though it may have evolved as a twist on Annabelle. Literary Arabellas abound; it’s also the title of a Strauss opera, an Arctic Monkeys song, and a minor Harry Potter character. Like so many long and lovely girl names, Arabella proves that names can be both pretty and edgy. Read more about Arabella here. 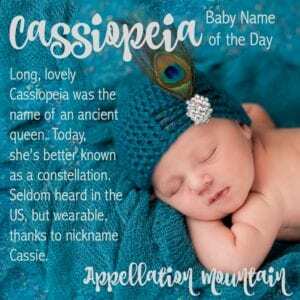 The similar Cassandra fits on this list, too, but among really long and lovely girl names, Cassiopeia goes the distance with five syllables. A constellation named for an ancient queen, nickname Cassie makes it easy to wear. The mythological figure was flawed, in a story immortalized by Clash of the Titans. And yet with names like Penelope and Orion feeling very mainstream, Cassiopeia’s backstory matters less than the elaborate, dramatic sound. Read more about Cassiopeia here. Elizabella sounds like it might be a foreign form of Elizabeth, but that’s not so. Italians favor Elisabetta; Elizaveta comes from Slavic languages. Instead, it’s a mash-up of Elizabeth and Isabella, which are just two forms of the same name to begin with. Alyssa Milano named her daughter Elizabella in 2014. The name remains rare, but it jumped in use following the high profile birth announcement. I’ve yet to write about Elizabella! When I do, I’ll add a link here. It’s easy to imagine parents who love Ruby considering other gemstone names, and Esmeralda is the Spanish word for emerald. But the name has a second connotation: it’s the name of a character from Victor Hugo’s 1831 The Hunchback of Notre Dame. Today’s generation of parents likely think of the 1996 Disney animated version, which simplifies the tale and adds singing gargoyles. Esmeralda might shorten to the unrelated name Esme, which is another rising choice from recent years. The poet Longfellow gave this name to his romantic heroine in his 1847 poem, Evangeline, A Tale of Acadie. Perhaps the literary tie explains some of the name’s current popularity, but chances are that it’s all about that Ev. From popular picks like Evelyn and Eva and Everly to the more obscure, it’s a sound that can take a baby name to the top of the charts today. Read more about Evangeline here. Julia comes to us from Ancient Rome. Elaborate forms Juliana and Julianna have been in use since at least the third century, when we find St. Juliana recorded. The single ‘n’ spelling is preferred today, but only by a small margin. Julianna ranks #200. It’s an elaborate name with a timeless feel, and the nicknames – Julie and Jules – are familiar to all. I’ve yet to write about Juliana. When I do, I’ll add the link here. Liliana stands as the most elaborate of the many lovely Lily names. Like Juliana, multiple spellings co-exist. In the US Top 1000, there’s Liliana, Lilianna, Lilliana, Lillianna, Lilyana, and Lilyanna. And yet, there’s something about Liliana, a four-syllable, elaborate yet accessible name for a girl. It’s romantic, and yet retains the sweet simplicity of a flower name. I’ve yet to write about Liliana. When I do, I’ll add the link here. Parents love place names, from Brooklyn to Savannah to Georgia to Aspen. Both Louisa and Louise have recently re-entered the US Top 1000. Combine the trends, and you’ll have the five-syllable place name Louisiana. It shortens nicely to Lulu, feels different without being difficult to say or spell, and brings to mind a decidedly Southern vibe with all the excitement of Mardi Gras, too. I’ve yet to write about Louisiana. When I do, I’ll add the link here. It’s true. 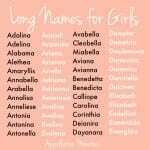 An awful lot of long and lovely girl names end with -ana. It’s just one of those go-to sounds for elaborating girls’ names. Mary + Anne becomes Marian and Mariana. Or possibly it’s a form of Roman family name Marianus. The Mariana Trench is the deepest part of the world’s oceans, making this a subtle nature name, too. And Tennyson penned “Mariana” in 1830. As with so many similar names, it’s worth noting that Marianna also appears in the US Top 1000. Read more about Mariana here. Once considered too tragic for a child’s name, Ophelia now feels like a replacement for her wildly popular Shakespearean sister, Olivia. The Lumineers put this one on future parents’ playlists with their 2016 single. Some might argue that this name usually takes a three-syllable pronunciation, oh FEEL yeh. 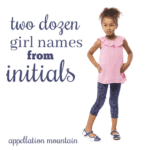 But thanks to Sophia and so many ends-with-ia names, I suspect parents might prefer to stretch it to four. Gorgeous and literary, Ophelia is right at home with classics like Mariana and newcomers like Elizabella, too. With Penelope such a fast favorite, parents might be persuaded to consider Persephone instead. Another borrowing from Greek myth – she becomes Proserpina in Roman tales – we all know her story. Persephone spends part of the year with her husband in the Underworld, and the other half with her mother, earth goddess Demeter, in the land of the living. When she returns to the workaday world, we enjoy Spring. That’s an appealing association for a child’s name. Seraphina refers to an order of angels – the fiery ones. We all know the name, thanks to Ben Affleck and Jennifer Garner’s middle child. While Seraphina has yet to catch on in a big way, the sounds are familiar to everyone. It nods to Stephanie and Sarah, Fiona and Josephine. While some of the rarities on this list might be rare enough to raise eyebrows, Seraphina strikes a good balance between being seldom used and generally familiar. Stella sits at #45, and we all know it is Latin for star. Stellamaris smooshes together the Latin word for star with the Latin word for sea. It’s a common title for Mary – Our Lady, Star of the Sea – which makes this name specifically spiritual. But maybe not exclusively so. After all, the imagery of Stellamaris could resonate for families with ties to the coast and the ocean; it’s often used for churches in such communities. And if long and lovely is your style, Stellamaris makes an unconventional entry in the category. I’ve yet to write about Stellamaris. When I do, I’ll add the link here. Theodore and Thea are racing up the charts. 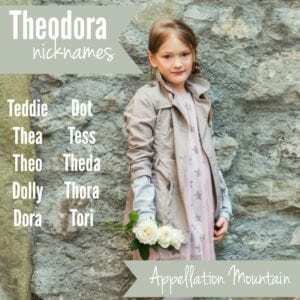 Can long, lovely girl names like Theodora and Theodosia be far behind? Theodosia has the Hamilton lullaby bonus, but Theodora comes with at least ten appealing short forms, including Thora and Dolly and maybe Tess. It’s easy to imagine parents frustrated that Josephine and Eleanor and Adelaide are catching on turn to the equally traditional, but less common, Theodora instead. Up until the 1950s, it regularly appeared in the US Top 1000. I’ve yet to write about Theodora, but check back and I’ll add the link here when I do. Love everything about Savannah, except for the name’s popularity? Leave behind the American South for the east coast of Spain. The country’s third largest city was originally settled as a Roman colony in 138 BC. The name comes from the Latin word for valor, so that makes this place name a virtue name, too. Looking for a musical tie? The Decembrists recorded “O Valencia!” in 2006. All together, it makes for an appealing rarity, and a long and lovely choice, too. Read more about Valencia here. Valentina leans romantic for two reasons. First, consider the long and lovely sound. But it comes from Valentine, as in the holiday of hearts and cupids we enjoy every February. The third century Saint Valentine wore a typical Roman name; it was derived from the Latin word valens – healthy and strong. That’s a lot to recommend Valentina. Factor in our love for V names like Vivian, and it’s easy to imagine this elaborate choice wearing well. Read more about Valentina here. Take the tailored, botanical Violet and transport it to Russia or Italy, and you’ll hear Violetta instead – dramatic, and, at least in English, surprising. It’s barely heard in the US, but thanks to the widespread familiarity of Violet, would almost certainly feel familiar. It’s the name of the main character in Verdi’s enduring opera, La traviata, adding even more drama and romance to the colorful name. Actress Alex Kingston named her daughter Salome Violetta. I’ve yet to write about Violetta, but check back and I’ll add the link when I do! I feel like this list could go on forever! 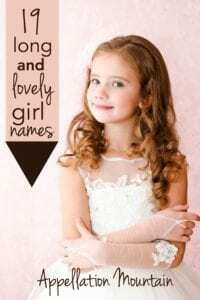 What are your favorite long and lovely girl names? Of these my faves are Liliana and Theodora. Likely to actually use: Theodora, Octavia, and Raziela are leading the pack and have my husband willing to short-list them. Rosalina has also been tossed around but I am not sure how it will be perceived compared to the others. Felicity/Felicienne is a point of contention in our household lol. Are there any other variants longer than Felicia? I love these names, especially Persephone and Cassiopeia. How do you say Elizabella? Is it ee-lie-za bella, or, ee-liz-a-bella (second syllable like Eliza Doolittle or Elizabeth taylor? My brain struggled to read this one. Long and lovely is my favourite kind of girl’s name. My daughters are Cordelia and Persephone. My other favourites are Anastasia, Evangeline, Isadora and Seraphina. Valencia,Leocadia, and Esmeralda are a few of my favorites from your list. I also love Pompeianna, Dowsabella, Thadeline, Candelaria, Praxillia, and Isadora . Sorry, forgot to say I’d add Donatella, too. My favourite D girl name. Loved this post! Arabella, Juliana and Liliana are my favourite A, J and L names. I’d add Oriana, my favourite O.